Kieren Lee's second half double helped Sheffield Wednesday come-from-behind to beat Nottingham Forest 2-1 at Hillsborough. The midfielder, making his 150th appearance in Owls colours, bagged a brace in the final quarter of a pulsating contest, including a last-minute winnger, to cancel out Henri Lansbury's 35th minute opener. It was Wednesday's fourth consecutive win over Forest and lifted them up to 11th in the standings. Head coach Carlos Carvalhal rotated his squad, making three alterations to the side who lost against Birmingham City last time out. Jack Hunt was preferred to Liam Palmer at right-back, Sam Hutchinson returned at centre-back after serving a one-match suspension while Gary Hooper was recalled up front. Palmer, Glenn Loovens and Almen Abdi dropped to the substitutes bench. With Daniel Pudil failing to shrug off a thigh injury, Adam Reach filled in again at left-back. David Jones (knee) and Lucas Joao (groin) missed out. Wednesday made a positive, confident start and Michael Mancienne hacked away a dangerous low cross by Jack Hunt in the early stages. Ross Wallace then pounced on a loose clearance by Mancienne and let fly from distance but his effort was acrobatically turned behind by Vladimir Stojkovic. The Owls continued to dominate possession and Hooper fired wide when well-placed after being fed by Ross Wallace as they kept asking questions of Forest's vulnerable backline. After a slow start, Forest gradually grew in confidence and Apostolos Vellios blazed over after a lovely knock down by former Arsenal player Henri Lansbury. 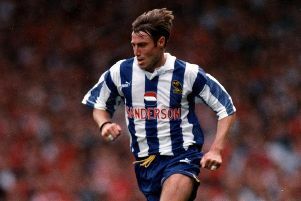 Moments later, Wednesday responded and Steven Fletcher, chasing his 100th league goal, chested the ball down beautifully before seeing his dipping left foot drive tipped away by Stojkovic. There was a worrying moment for the hosts when Ben Osborn fizzed in an inviting corner towards the back post which Matt Mills side-footed wide. The Owls still looked more likely to open the scoring and came agonisingly close in the 32nd minute, Hooper's header from Barry Bannan's inch perfect cross was spilled by Stojkovic and Forest managed to clear their lines with Fernando Forestieri lurking. And Forest made Wednesday pay for their profligacy in front of goal, breaking the deadlock through Lansbury. Mustapha Carayol squared to the midfielder and his 30-yard strike took a big deflection off Bannan and went in off the underside of the crossbar, giving Westwood no chance. The visitors nearly doubled their advantage only for Vellios to be foiled by the agility of Westwood after another rapid counter attack. Wednesday kept passing and probing after the re-start and it took a fine block from Chris Cohen to prevent Hooper from testing the reflexes of Stojkovic following a good cut back by Hunt. A lovely move involving Forestieri and Fletcher threatened to unlock Forest's organised backline but Hooper failed to connect with Fletcher's excellent centre. And Forest almost caught the Owls napping at the other end and Westwood pulled off a superb save on the stretch to keep out Vellios' header after a great delivery by Eric Lichaj. Things got even worse for Wednesday when Tom Lees was forced off with an injury. He was replaced by Loovens. But Carvalhal's charges levelled things up midway through the second period, Lee powering in Wallace's corner to lift the spirits of the home faithful. After Bannan was also brought off after suffering an injury, Forestieri showed lovely footwork to dribble past several Forest defenders but his attempt was brilliantly blocked by the outstanding Mancienne. It was all Wednesday in the closing stages, with Stojkovic producing a smart double save to deny Hunt and Almen Abdi. The Owls came even close to grabbing a late winner when Wallace's delicate chip Stojkovic looked destined to go in but captain Cohen some how headed it off the line and to safety. It appeared set to finish all square but Lee completed a remarkable turnaround in added on time, turning in Fletcher's low centre to hand Wednesday their fourth Hillsborough success of the season. Owls: Westwood; Hunt, Lees (Loovens 58), Hutchinson, Reach; Wallace, Lee, Bannan (Abdi 72), Forestieri; Hooper (Nuhiu 82), Fletcher. Substitutes: Dawson, Palmer, Semedo, Buckley. Forest: Stojkovic; Pereira, Mancienne, Mills, Lichaj; Cohen; Carayol (Kasami 59), Lansbury, Grant (Dumitru-Cardoso 82), Osborn; Vellios (Bendtner 77). Substitutes: Smith, Fox, Vaughan, J.Worrall.